The first thing that came to mind when I tested Orvis’s latest fly rod, the Recon, was: this blank was lovingly designed and crafted. That’s saying a lot. Add up all of the tech, the know-how and sheer effort involved in producing a fly rod, and still – IMO – two-thirds of fly rods miss the mark, including some in the upper price echelons. The reason is that they’ll cast well, but won’t really be up to the task when playing and landing a fish. For some odd reason, I was expecting the Recon to be part of that group (might have been that snazzy, quasi space-age-looking rod tube that threw me off… ). I unpacked the rod and that prejudice faded in an instant. I saw classic dark moss paint, classic hardware and a classic feel, which was confirmed on the water. As with most new-school rods, the Recon tech package insures that it is very light and packs enough power to deliver your flies at the required distances. The rod speaks short and long range fluently. That said, Orvis still managed to imbue this rod with a bit of old-school charm, which was demonstrated while playing and landed the first fish. The Recon is an exemplary blend of power and sensitivity. It also played a big part in enabling me to fish 8x tippet with confidence. Reading about a blank formula will never completely convey what a blank acts or feels like. What I can state is that the level of pleasure in landing a ¾ pound rainbow often depends on the rod you’re holding – and that this is a rod you’ll really want to do that with. One of this rod’s finer points: strike detection is rendered considerably less demanding, mostly due to the nervous tip section. Also, mending can be executed elegantly and with striking precision. This can’t often be said of rods that rely mostly on torque as a selling point. Now back to that fish that fought a heroic battle. This is one of the characteristics I want a fly rod to render—one that enables us to feel that battle and adjust for every sneaky detour and angry streak away from the boat. 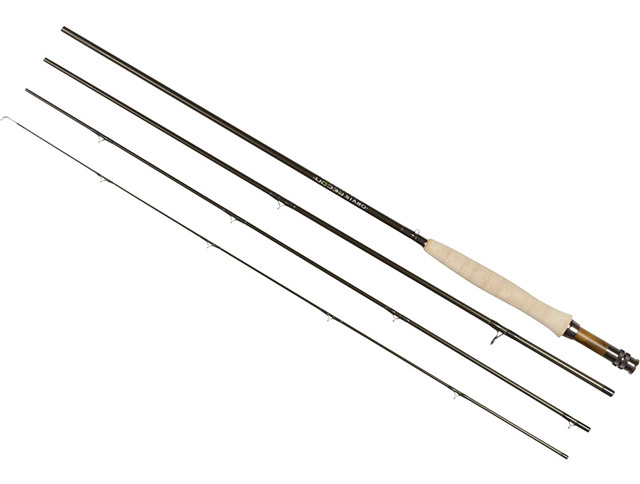 The Recon was crafted with all of this in mind: it’s a fishing rod – not just a casting implement. It’s a safe bet that Orvis obsessed over this fly rod before settling on the final blank formula. They threw space age technology into the pot, blended that with fine materials and craftsmanship, then added a generous dash of finesse when it came time to calibrate the blank. If trout are your obsession, you’d be doing yourself a disservice by not checking out this sweet fly rod. Note that the only reels that will balance properly with the Recon are in the light to ultra-light category.